Six contre une galaxie ! → Star Wars (Marvel - 1°) #3 (09/77) Star Wars - Death Star! Face à Dark Vador ! → Star Wars (Marvel - 1°) #5 (11/77) Star Wars - Lo, The Moons Of Yavin! → Star Wars (Marvel - 1°) #6 (12/77) Star Wars - Is This...The Final Chapter? → Star Wars (Marvel - 1°) #7 (01/78) New Planets, New Perils! 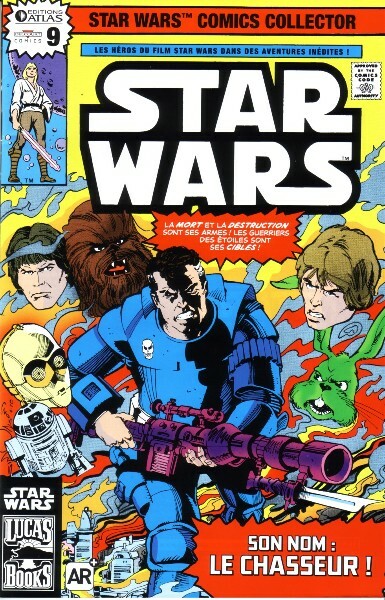 → Star Wars (Marvel - 1°) #9 (03/78) Showdown On A Wasteland World! Le colosse venu d'en bas ! → Star Wars (Marvel - 1°) #11 (05/78) Star Search! → Star Wars (Marvel - 1°) #12 (06/78) Doomworld! Face aux princes dragons ! → Star Wars (Marvel - 1°) #13 (07/78) Day Of The Dragon Lords! Comme un parfum d'apocalypse ! → Star Wars (Marvel - 1°) #14 (08/78) The Sound Of Armageddon! Duel dans les étoiles ! → Star Wars (Marvel - 1°) #15 (09/78) Star Duel! → Star Wars (Marvel - 1°) #16 (10/78) The Hunter! → Star Wars (Marvel - 1°) #18 (12/78) The Empire Strikes! → Star Wars (Marvel - 1°) #19 (01/79) The Ultimate Gamble! → Star Wars (Marvel - 1°) #21 (03/79) Shadow Of A Dark Lord! → Star Wars (Marvel - 1°) #22 (04/79) To The Last Gladiator! → Star Wars (Marvel - 1°) #23 (05/79) Flight Into Fury! → Star Wars (Marvel - 1°) #25 (07/79) Siege At Yavin! → Star Wars (Marvel - 1°) #26 (08/79) Doom Mission!